Every November, Ironman Arizona brings some of the best triathletes in the world to the desert oases of Tempe/Scottsdale. Nearly 3000 athletes will begin their adventure at 7am in Tempe Town Lake on race day. If history is any guide, several hundred participants will be racing in their first Ironman triathlon, or at a minimum, their first Ironman on this course in Arizona. I suspect many of those participants are spending their last few weeks of training wondering what the course will be like on race day. That’s what we're here for. I raced in the first two Ironman Arizona events, and I can tell you that unless there’s a monsoon on race day – the course if fast and enjoyable. 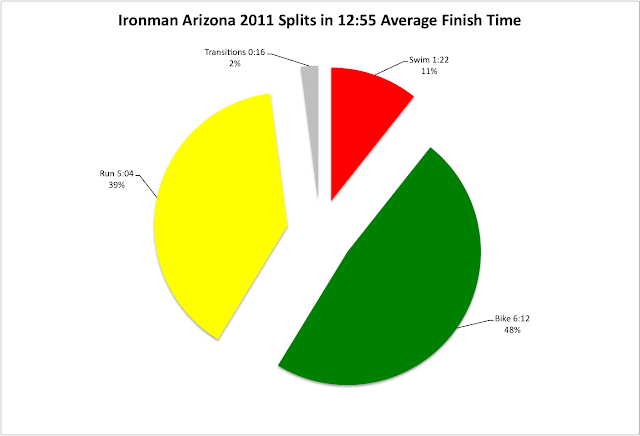 Here’s how to get the most out of Ironman Arizona on race day.The town of Tempe Arizona seems to have embraced Ironman, and they support the event enthusiastically. The weather tends to be excellent in November in Arizona, with plenty of sunshine. Bring your sunglasses. The Tempe/Scottsdale area may well be the spa capitol of the United States, with its dry air, desert aroma and peaceful environment. You will understand why as you walk to the transition area in spacious Tempe Beach Park on race morning. The sun will be rising quietly from the east, and a glow on the horizon will begin to light the transition area. Things will probably very calm in the transition area as participants make their final adjustments to transition bag contents, water bottles, etc. Then just sit on the grass and relax. As is the case with all Ironman North America events, all participants need to walk over a timing mat to enter the water. And as usual, getting nearly 2000 bodies over that mat by 7am tends to create a little panic. The fact that it’s a deep water start means that once over the mat, just about everyone needs to jump in and tread water until the gun fires. Which leads to natural procrastination – many want to wait until the last minute, and that does can lead to some anxious moments for those at the back of the line. My suggestion: cross the timing mat at 6:45am, get in the water and swim towards the start line, about 100 meters away. The right wall of the canal is naturally sloped, and you can find a spot to rest on the concrete. There you can relax without treading water until you want, with plenty of time to spare. The swim in Tempe Town Lake is as straightforward as they come – a single lap in a narrow canal between Tempe and Scottsdale. Locals cringe at the thought of people actually swimming in the brown water, but the water quality is about the same as at many Ironman events around the world: not good, could be worse. If you’re one of the fast swimmers, move up to the front, and speed away when the cannon fires. I’m not one of the fast swimmers, so I position myself a good 20 meters from the line, and try to find some room. Unfortunately, with that many people in the water, and the canal being fairly narrow, room to spread out is rare. Those hoping to start on the outside of the pack will find that an outside doesn’t really exist. But once the cannon fires, the swim actually begins fairly smoothly. I do position myself as outside as possible, on the canal wall, and let the others fight for an inside lane. It’s not a bad strategy except for one caution: if not careful, you can find yourself swimming up a boat launch driveway that enters the water along the wall. I did it last year. Otherwise it’s a good swim course. There is no current to speak of. Sighting is easy. Don’t worry about buoys, just swim in the direction of the rising sun. The swim turnaround is beyond the Scottsdale Ave bridge; you can’t miss it if you’re looking ahead, wondering how far you have to go. Same is true on the way back; you have to pass under the Mill Ave bridge, and then you exit the water. Done. I really like the Ironman Arizona bike course, though I suppose those hoping for lush greenery will be somewhat disappointed. The bike course is three loops of approximately 37 miles out toward the McDowell Mountains and back. Once out of Tempe, there’s not much to see other than the mountains, which I found as a great way to just settle into a zone and ride. The bike course elevation chart indicates the course slowly gains ground from 1150ft to 1600ft above sea level. It’s all on a very slight incline that plays out over many miles. There will be no steep climb where you need your 25 gear. In both years I raced there, we experienced a nice tailwind out of town, which made the first 18 or so miles a pleasure. The return trip of 18 miles was, naturally, into a headwind, but perhaps the effects of that wind were tempered somewhat by the slight downhill. Still, the winds were strong enough to blow tumbleweeds across the highway, as you’ve seen in late night TV Western movies. Honestly, I have entered the Ironman Azirona bike course both years sufficiently undertrained to ride 112 miles. Both years, only two outdoor rides, about 20-25 miles each, before race day. Longest indoor ride: 3 hours. How many indoor training rides? Not nearly enough. 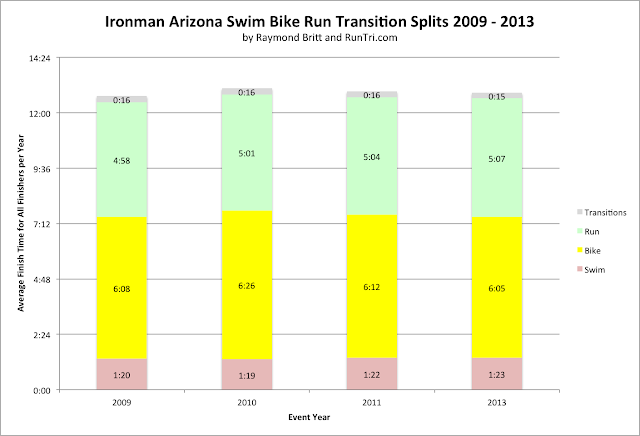 Still, I found the Ironman Arizona bike course to be quite forgiving. I was relatively fast in both years (about 20mph, a good speed for me in an Ironman), and didn’t have that much difficulty. Both times I felt strong heading into the run. Important note: the air is deceptively dry in Arizona. You will need to hydrate more than normal. Don’t skip water bottles at aid stations. Drink more than you normally would in a race, especially on the bike, as it will help determine your conditioning as the run begins. The run course in 2006 consisted of three laps, mainly on running paths around the Tempe Town Lake and the dry bed of rocks west of its dam. This course change was a disappointment, as the 2005 course diverted north, truly into the desert on a sandy path, behind small mountains that served as a natural boundary for the Phoenix Zoo. I suspect the course change was instituted to make it easier to manage aid stations, and that’s understandable. The good part of a three loop course (which may be different for the 2008 race) is that it’s lined with supporters cheering along the Tempe side of the lake. The enthusiasm of the spectators and aid station volunteers is inspiring, and you will find yourself smiling through the pain and fatigue that may be setting in. To simplify the course a little more, think of it generally as six 4-mile sections. Three laps, each with 4 miles on either side of the Lake. Break it into those sections, and take them one at a time. The first is a warmup, time to get the legs in gear. The second is when you find your groove. The third takes you to the halfway point. And so on. On your way to the finish, admire Arizona’s spectacular sunset. No matter how you are feeling during that part of the run, you will look at it and say to yourself: this is why I race, for moments like this. Savor those moments. Soon, you’ll be crossing the line for one more great moment: you will be an Ironman.